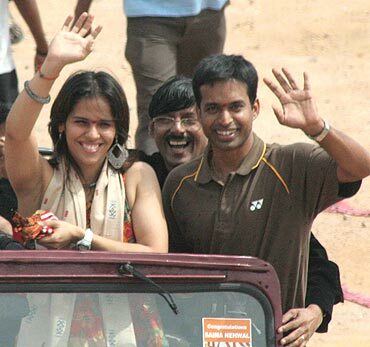 Having risen swiftly to the No 2 ranking in world badminton, Indian badminton ace Saina Nehwal is confident of ascending to the summit soon. "I am very happy to achieve the world number two so soon in my career. The last three wins have really helped me. It is a great feeling, but I feel my priority still will be to win more tournaments for India rather than focussing on ranking," Saina said on Thursday, after the latest rankings were released. "It will be difficult to hold on to the ranking, but I hope to continue my hard work and win more titles and become the number one player soon," said the Hyderabadi shuttler, who is down with cold and fever. The 20-year-old made a meteoric rise to world No 3 last month following back-to-back title triumphs at the India Open Grand Prix and the Singapore Open Super Series. After then defending her Indonesian Open Super Series crown to complete a hat-trick of titles it was just a matter of time that she would take the No 2 spot. By virtue of the consecutive title wins, Saina now has 64791.2637 points and is just behind Chinese Yihan Wang. In the process, she displaced Xin Wang of China to third place. Saina's father, Harvir Singh, also expressed happiness and hope that his daughter will continue her good work for the country. "God has been kind. It is a marvellous achievement. I hope she can continue to work hard and win more laurels for the country," he said. 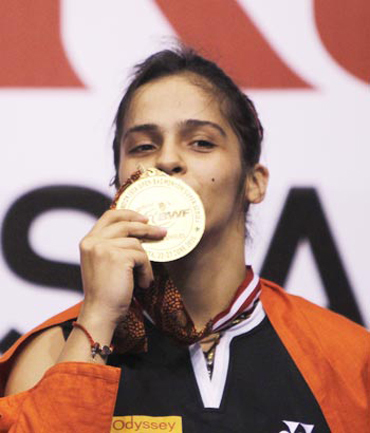 In March, Saina had attained the No 5 ranking after becoming the first Indian woman to reach the semi-finals of the prestigious All England Super Series Championships. However, she dropped to sixth place in the subsequent weeks. Her next engagement will be in the World Badminton Championship in Paris next month, before the Commonwealth Games and Asian Games follow. In the men's ranking, the Indian trio of Chetan Anand, P Kashyap and Arvind Bhatt were placed at 15th, 25th and 27th spots respectively, while mixed doubles pair of Jwala Gutta and V Diju were static at the seventh place.